Let’s face it. Filling out surveys is a chore. No one wants to admit it but they don’t want to spend their free time helping you figure out whether you did a good job. The best way to get online reviews is to find ways to make connections with customers that matter to them before asking them to do you a favour. Disguise requests for reviews within your existing marketing plan so that it flows naturally. Here are 7 tips for getting your customer to leave authentic reviews without bribing them. The review process varies based on the website chosen. It’s best to stick to one outlet first so that you can keep all your reviews in one place when manually collecting customer reviews. You need the ability to track when reviews get posted and the marketing approach that leads to the most traffic. The benefit of tracking is that you’ll learn customer habits and see where you can improve later. Too many places to track will discourage you from creating a system that works. Print a list of steps each customer needs to take leave a review online. Post instructions near the checkout counter so everyone sees your intention to grow your online presence. Collect email and mailing addresses from each customer so that you can follow up with reminders of these instructions during outreach campaigns. Never ask a customer for a compliment. Instead, be subtle by sending a follow-up postcard thanking them for their business. If your business is very small, make a note of what your customers bought and follow up specifically on that purchase. Show interest in whether they are still satisfied or if there’s anything you can do if they are not. Letting customers see that you are interested in an ongoing relationship makes your business stand out from competitors and is more likely to encourage a review. Product reviews are rampant on the internet because customers love to share advice with other customers. Set up a station in your business where customers can answer frequently asked questions of other customers. If you have an online business, consider setting up an area on your website instead. Use the question and answer section on Amazon as a reference. Amazon allows customers to ask product questions and receive answers from other customers. Getting the help of your customers has a two-part benefit. First, customers are inspired to leave opinions. Second, personal experiences offer real-world solutions that many customer service teams just can't explain. Limit the space provided to respond to each question in order to both respect the customer’s time and encourage them to follow up with more later. A customer who sees another person in need may be motivated to continue their response online to make sure they were helpful. Engage with customers who leave reviews. Don’t just focus on the negative reviews. Comment on positive reviews with specific points to show you read the message. 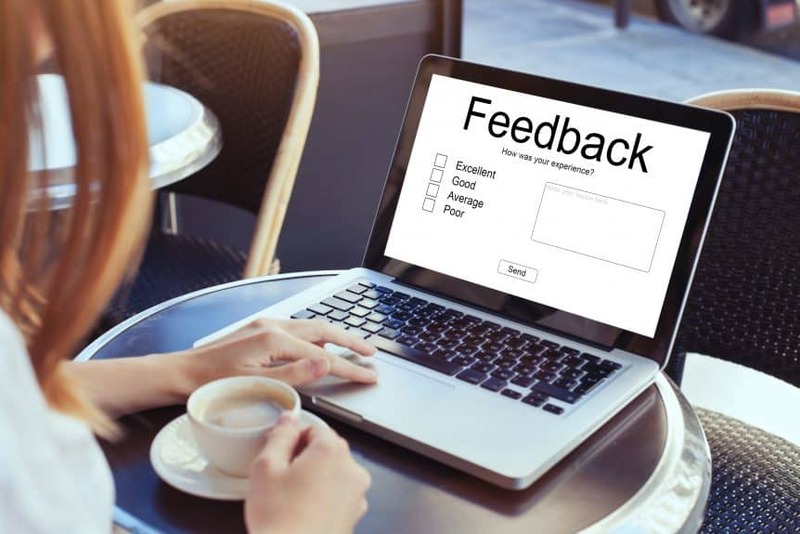 According to the Harvard Business Review, businesses who take the time to respond to feedback increase reviews by 12 percent. The satisfaction rating also gets higher over time. Be friendly while acknowledging what steps you plan to take to fix issues. Never blame the customer or make excuses. It makes you appear defensive and unwilling to communicate about shortcomings in your business. An open, cheerful dialogue attracts more conversation. This may seem time-consuming but it pays off in the long run as more customers see your brand as one that can build a relationship with. Automation is helpful for businesses with high customer traffic. You need a system of requesting, collecting and tracking customer reviews to be sure no opportunities are missed. The greatest benefit of automation is customer reach. Invites can be sent over social media, by mail and email to ensure everyone has the opportunity to leave feedback. A good automation service allows you to track campaign progress to see where you are most successful. Statistics in reports show where reviews came from and when they are created. Generate a direct link to where you want customers to leave reviews. Instead of trusting them to navigate review sites, take them exactly where you want them to land. This method decreases the chances of a customer becoming distracted when navigating online. Choose sites that help improve your search rankings for best results. Google, Yelp, and Facebook are three good choices to pick from. Send your direct link via email to current customers or add badges to your website. Website badges easily direct visitors to your Facebook, Yelp or Amazon page to submit a review. Advertise this option on your home page for better visibility. New businesses may not have the customer base to generate enough reviews. While you’re getting started your main customer base is usually family and friends. Don’t be afraid to ask them for reviews. Word of mouth is important even when the customers know you personally. They can speak to aspects of the business an outsider wouldn’t know from just a few visits. Allow friends to give feedback on your character if they aren’t an actual customer. The goal is the review to be genuine and not appear staged. Fake reviews lose your business credibility and customers are less likely to rely on them in the future. Keep the reviews professional by asking them to answer specific questions about your product or the way you do business. Reviews that sound like family members leaving personal messages will likely be ignored by customers. There are many cost-effective ways to get online reviews for your business. The best reviews you can get reveal your business as trustworthy even when customers have bad experiences. Respond to every posted review to assure your audience you are listening. The benefit is a larger online presence that leads to more revenue for your business.